We'll be away until 17th March, so no posting will be likely until after that date ! 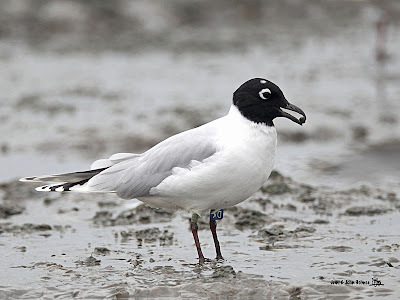 There have been several "decent" tides at Mai Po over the last few days, and the Saunders' Gulls have been showing well. Up to sixty have been foraging on the mudflats in front of the boardwalk hides. This was the first we've seen with a leg flag. 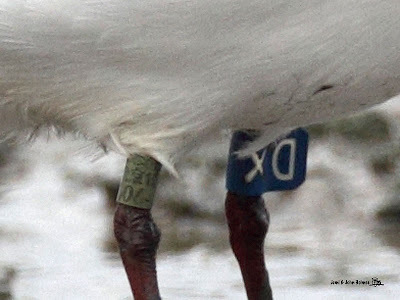 A response to these photos posted on the HKBWS website indicates that it was flagged in Yancheng National Nature Reserve, Jiangsu Province. 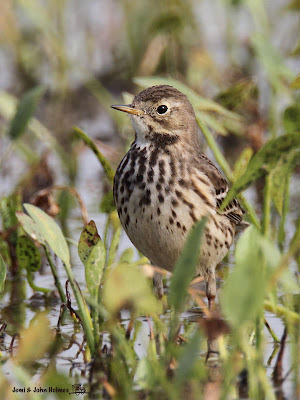 Yancheng is a breeding site for this species, which winters here in Hong Kong. 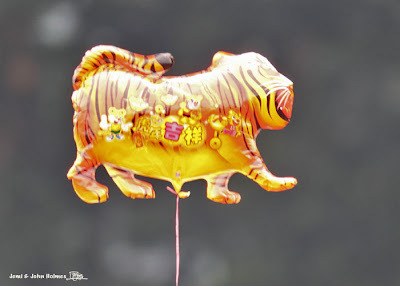 The third day of the Year of the Tiger, and also the coldest day of the winter in HK so far, 7 degrees centigrade. 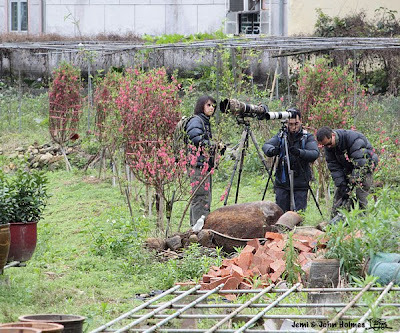 We went to Lam Tsuen Valley this morning, to search the flower gardens and terraces for a Bull-headed Shrike. 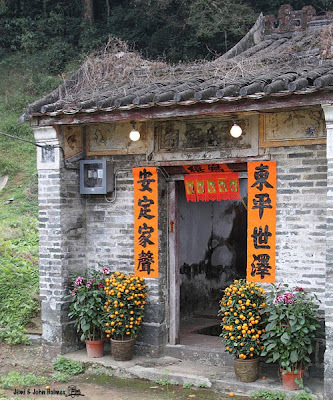 It was either too early or too cold for the "Wishing Tree" crowds and we sailed through the bottom end of the valley, eventually arriving at Tai Om Tsuen. 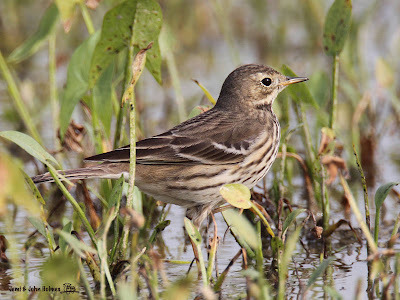 At the river's edge opposite the Chan Shum Kee Store we found some birding friends who told us the bird had been favouring the fields behind a rise a hundred metres or so distant. Beyond a stream the ground rose slightly and we found some older houses and a small temple overlooking some market gardens. The temple and some of the houses were bedecked with Lunar New Year papers. Pots of flowers and "gat chai" (miniature tangerine trees) were prominently displayed. The gardens - with most of the flowers sold off - looked strangely empty. As if to remind us what year it was (and is), a child's balloon drifted past. flew to the top of a wooden telegraph pole before disappearing. Twenty minutes later it reappeared on a pole above some unsold peach trees. I got a few photos from beside an empty greenhouse. The bird vanished again and we drifted up to the front of Tai Yeung Che village. A number of villagers seemed to be back from the UK for the New Year holidays, and were interested to know what we were looking for. The joy of digital photography was being able to show to people exactly what the object of our attention was. 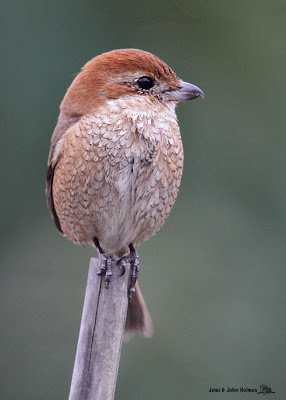 Meanwhile, almost stealthily, the Bull-headed Shrike appeared in front of us at eye height. But AFTER LNY, the spring of tropical south China is officially here. Anyway, I haven't been out, so here's one from sunny December ! Strange how the bottom two are flying upside down, don'tcha think ? Sunday February 7th "tanked" with rain. "For the first time in its 26 year history the race was a 12 hour race as opposed to 24 hours. It was also the earliest date in the year that the race has been run - for the first 15 years it was always an early April race and since 2000 has always been in late Feb/early March. The Wandering Tattlers Team were sponsored at a corporate level by Hong Kong Electric this year. The start of the race, 6.30am, found us at Ho Chung, in darkness - picking up two sepcies of owls calling from the hillside. The dawn chorus there brought us another 20 species. Elated we rushed to Sai Kung for the Sea Eagle as it caught the morning thermals up from its roost on Kau Sai Chau. 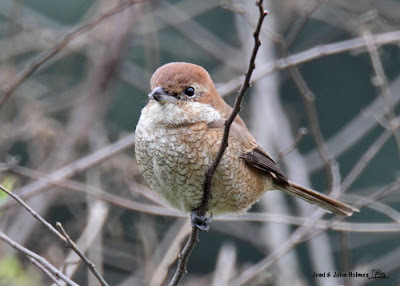 Then it began to rain……..
We dropped about 5 species in Tai Po Kau because the birds were not calling. Airfield Road near Shek Kong was even more difficult though the benefits of the scouting earlier in the week by other team members became apparent - particularly in being able to find a silent bedraggled Rubythroat in the same bush that it had been happily singing in earlier in the week. Things were better at Nam Sang Wai - ducks like water - though we debated a Ferruginous Duck and dismissed it only for it to be considered and accepted as the bird of the race by one other team. Long Valley was equally miserable - though Snipe like water too. We waded through shin-deep paths to locate the Painted Snipe but completely missed the Munias - sensibly under cover somewhere out of sight. Our next stop at San Tin ponds was surprisingly a great success for the starlings and Common Myna (which is not at all common in HK). Finally to Mai Po. As usual we trudged round the marsh for nearly four hours, spending only an hour in the warm dryness of the boardwalk hide and most of the time completely exposed to the elements. We found 10 species of gull and tern on the mudflats and plenty of waders and raptors - though we missed the Striated Heron (two of us missed it by a few seconds) and we missed two Great Bitterns (seen in quick succession by another team 20m ahead of us). End result - we saw 135 species and came a very happy 2nd out of the 12 teams in the race. As usual the race was very close - the top 5 teams saw 136, 135, 134, 133 and 132 species respectively. We raised more money than any other team - HK$72,000 excluding the corporate sponsor. Our bird of the day was the White-bellied Sea Eagle - the last bird before it started raining…"
And as Tim went on to say... Many Thanks to HK Electric - our corporate sponsor - and all our individual sponsors as well, for putting their hands in their pockets in these sometimes difficult times. 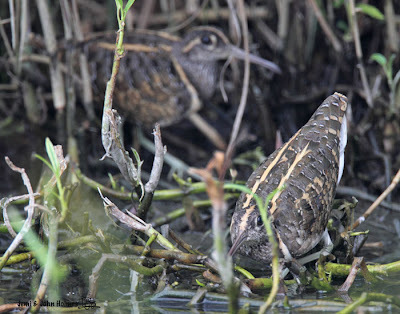 Painted Snipe - WELL seen in Long Valley as we splashed around during the BBR. Well, I've been quiet for a few days, but I'm still in town and covering some ground for the WWF Hong Kong Big Bird Race 2010. Hong Kong's first BBR was in 1984 (two teams). In 1985 there were five teams, but by 1986 - my first year of participation - there were 12 teams involved. Since then Hong Kong's Big Bird Race has probably raised more money for conservation than any other in the world. In April 1986 I drove the Police Team. We were loaned a van by our sponsors, the courier company DHL. A van was always good for extended tripod legs, overnight bags of clothing, and "eskies" with liquid refreshment. On a Saturday morning before 07:00 I made my mark by getting us from the Botanical Gardens on Hong Kong Island to Tai Po Kau in the New Territories in less than twenty minutes. I remember seeing all those green lights ahead of me on Princess Margaret Road and putting "pedal to the metal" (something you'd probably skip in a Honda these days). As we raced towards the Lion Rock Tunnel there were howls of fearful protest from the back. A couple of those guys still claim they can trace their grey hair and various nervous afflictions to the stresses inflicted on their delicate psyches in those few moments. What softies. Still "Tempus Fugit", and all that. These days I'm in the "Wandering Tattlers" Team (not driving) and we're sponsored by HK Electric this year. The other team members, who only have to put up with my sparkling wit for a prolonged period are Roger Muscroft, Tim Woodward and Andrew Young. Roger, who owns the biggest car, has the double joy of driving as well. It's usually a good idea to check out a range of previously productive sites, and try to cobble a route together for the day. The race runs from 06:30 to 18:30 on Sunday Feb. 7th. 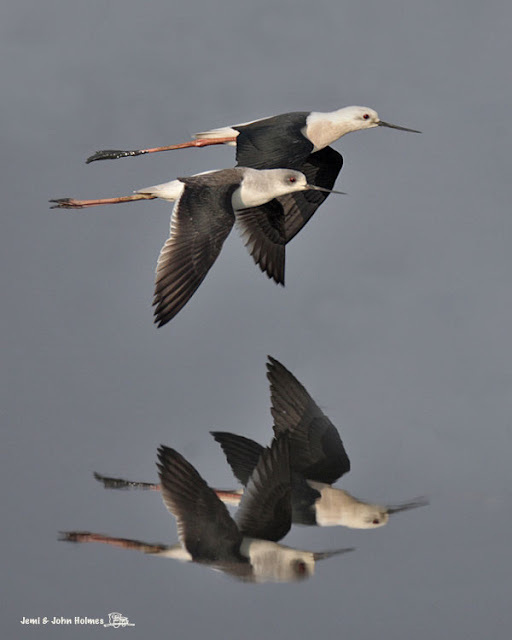 We need to be at Mai Po Nature Reserve in late afternoon for the high tide and for the race finish, which is at the Car Park of the Sir Peter Scott field studies centre. Long Valley will be on a shortlist of "must visit" sites, and we'll be hoping to see some of THESE on the BBR day.